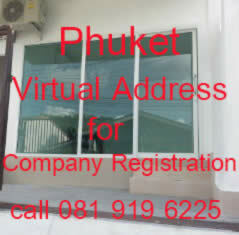 Dormant Company in Thailand, Bangkok and Phuket ,sleep - dormant company means a company without any business activity in Thailand Bangkok and Phuket. ( 7 years, 2 years and 1 year). 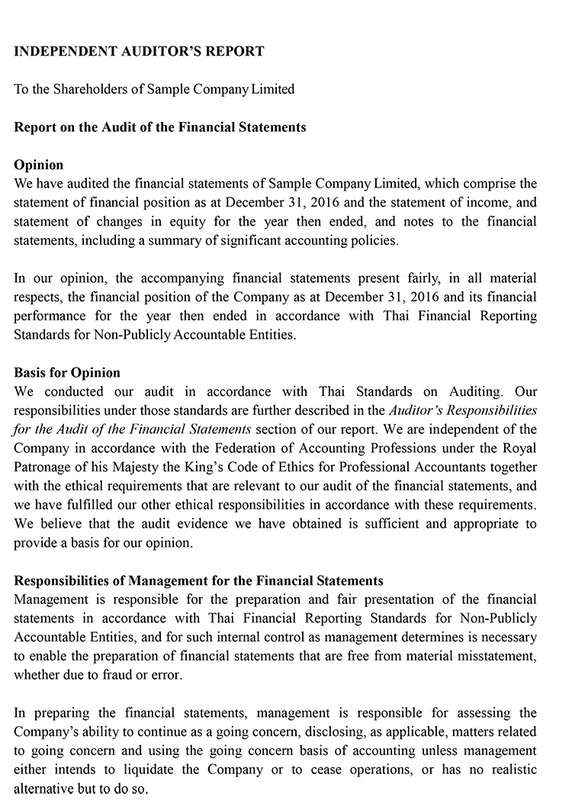 How we serve Accounting, Auditing and Corporate Income Tax for a dormant company in Thailand (Shelf company in Thailand). 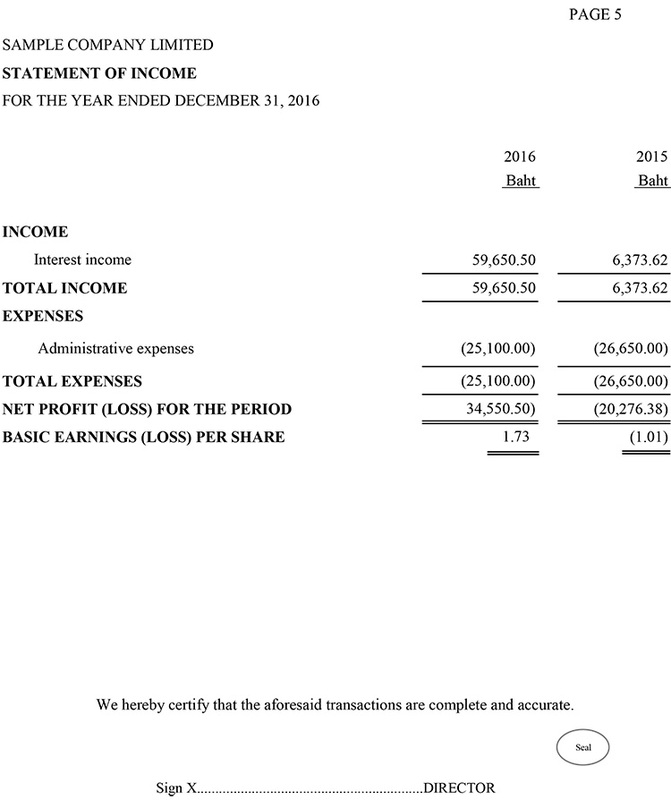 (Our fee, excluding tax amount, actual cost for step of AGM). Scopes of service for - Dormant company; a company without business activity. 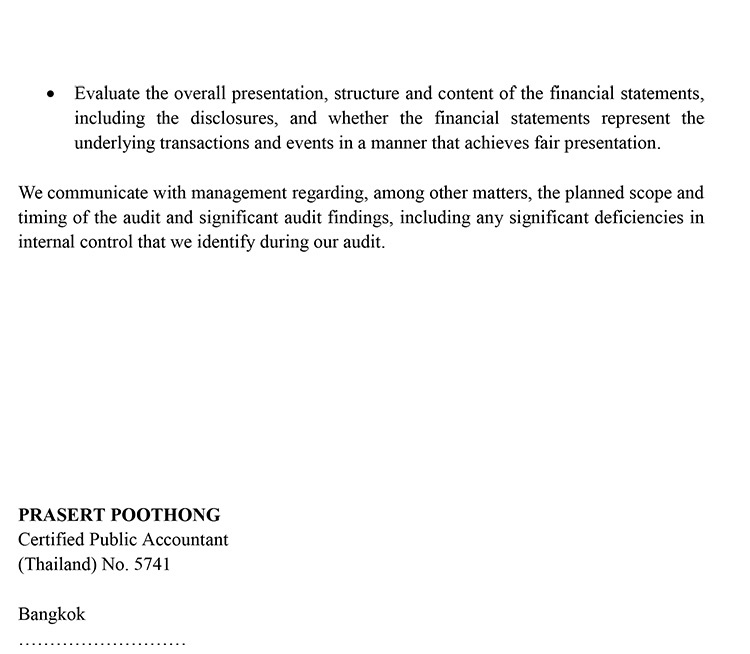 Preparation of Yearly Audit Financial Statement with certified and audited by Certified Public Accountant (CPA, Thailand) and issue auditor's report in English version. Preparation for accounting records such as Journal, General Ledger, Trial Balance and Financial Statements and issue Financial Statement in English version. Preparation of secretarial documents consisted of: Application form for Company's Information Submission (Sor.Bor.Chor.3) Form, Shareholders’ List (Bor.Oor.Jor.5) Form. We will be applied as chartered accountant (with bachelor degree in Major of Accounting) to Ministry of Commerce (MoC) as accountant of your company. To file(submit) to related government consists of: The Revenue Department (RD) and MoC (E-filing). Step of AGM, to follow the enforcement of the Civil and Commercial Code sector 1175 regarding the “Sending of Invitation Letter for annual shareholders meeting”, it’s effect to the approval for the financial statement of year ended December 31, 2009 and onward, therefore all company must send the notice (letter) to invite all shareholders for holding of the annual meeting by post with advice of delivery service and must publish in a local news paper, both procedures require to be done at least 7 days before the meeting date (case of extra-ordinary meeting require at least 14 days). Furthermore, our accounting service shall be practiced carefully under the Accounting Act of B.E 2000 and also comply with Thai Accounting Standard (TAS) and Taxation rule. This fee is valid until March 31, 2017 (may change after this date) and can provide to limited clients. Step of AGM, Company Limited must follow the enforcement of the Civil and Commercial Code sector 1175 regarding the “Sending of Invitation Letter for annual shareholders meeting” which can be done by you, for more information Click Here . 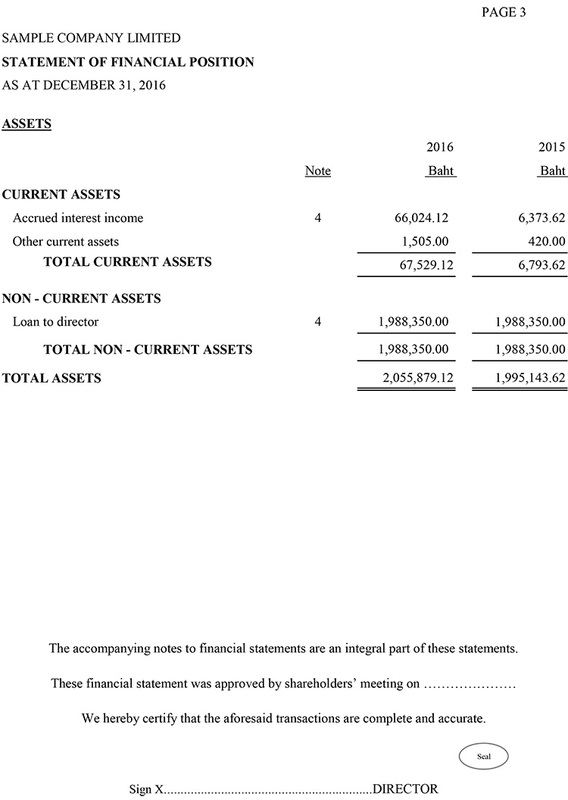 Whole year services for dormant company; scope and fee; please see Q4 below. 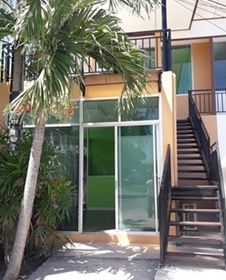 The Revenue Department at company’s area. 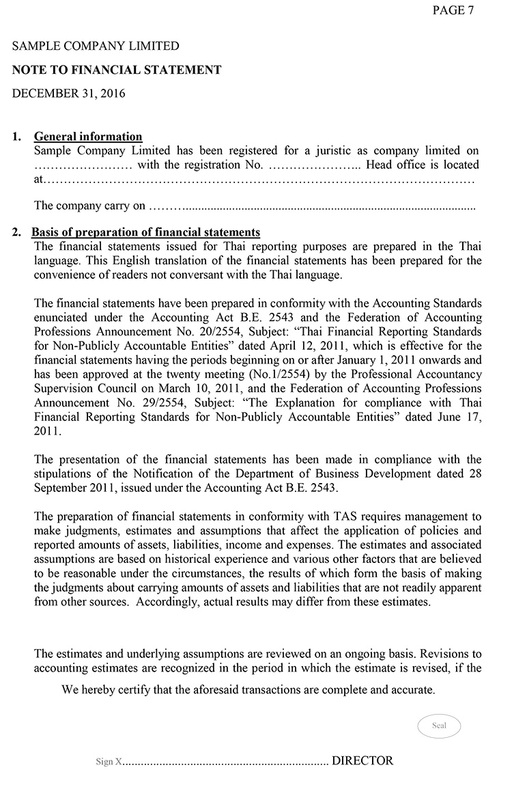 Financial Statement with certified by auditor (CPA Thailand), 1 set. Deadline: within 150 days from fiscal year of accounting period. 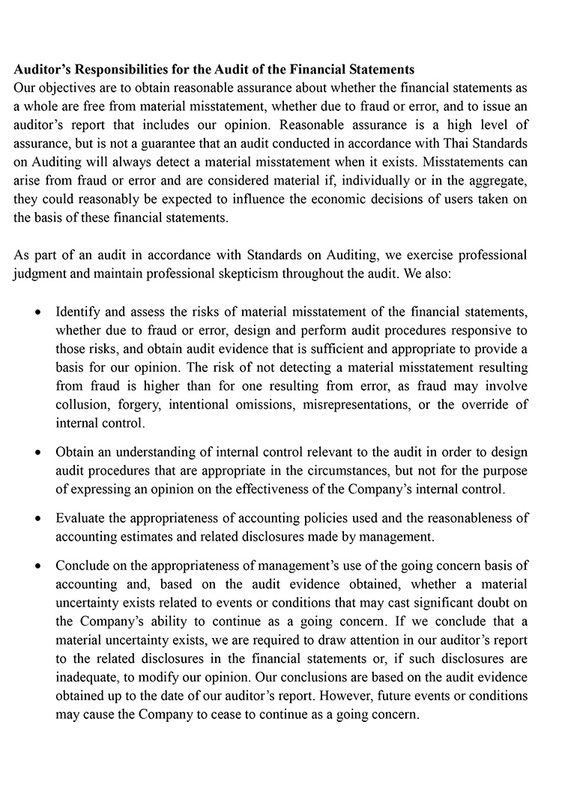 Financial Statement with certified by auditor, 2 sets. Deadline: within 1 month from Annual General Meeting (AGM) and AGM must be held within 4 months from fiscal year of accounting period. Q1: What are Government expected tax amount of dormant company I have to take in consideration for one year? You do not put that capital fund into bank that mean still keep in your personal bank, that fund must be recorded as “Loan to director”, this kind of income is “Interest” form its loan. Applicable interest rate for this borrowing is 4% per annum. **SBT – Tax amount = 3.3% of 400,000 = Baht 13,200 per year, will be paid when settle interest of loan. CIT = Baht 4,500 per year. **SBT = Baht 6,600 per year. 2. 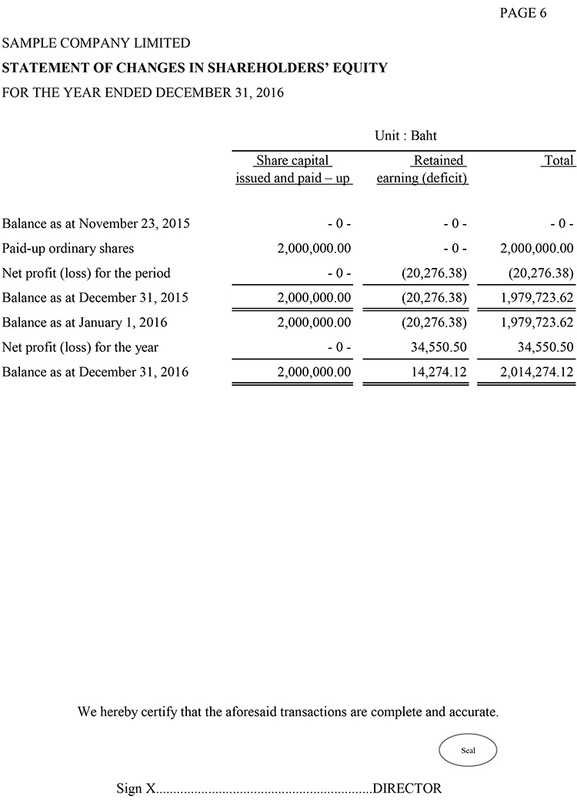 Setting up company with capital no exceeding Baht 5 million and paid up only 25% of registered capital. CIT = Baht 0.00 per year. **SBT = Baht 1,650 per year. 3. 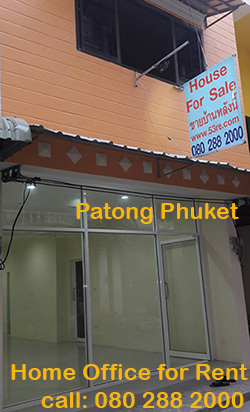 We recommends you to set up company with capital of Baht 1 million and paid up only 25% of registered capital. **SBT = Baht 330 per year. b. Half year tax, except for the first year, but for the second year and onwards will be paid at least 50% of CIT, and can use its tax as credit amount for CIT’s calculation at ending period. c. Monthly withholding tax, will withhold and be paid within 7th day of the following month. Normally, dormant company no business activity will no withholding tax amount. d. VAT, there are no requirement for registration of dormant company because of income still not exceeding Baht 1.8 million. VAT registration can be done later when start the business activity. e. **Special Business Tax (SBT), base on “Interest Income” from “Loan to director” by applicable tax rate is 3.3% per annum. Panwa: Most of new registered company in Thailand were not real put the capital fund into bank account of company, they only declare on step of registration by certify on documents that the shareholder had put that fund to company account already (likely keep into individual of shareholders’ account or keep on hand of shareholder that mean shareholder or director keep on behalf of the company and waiting for put to company bank account in future without specific time). 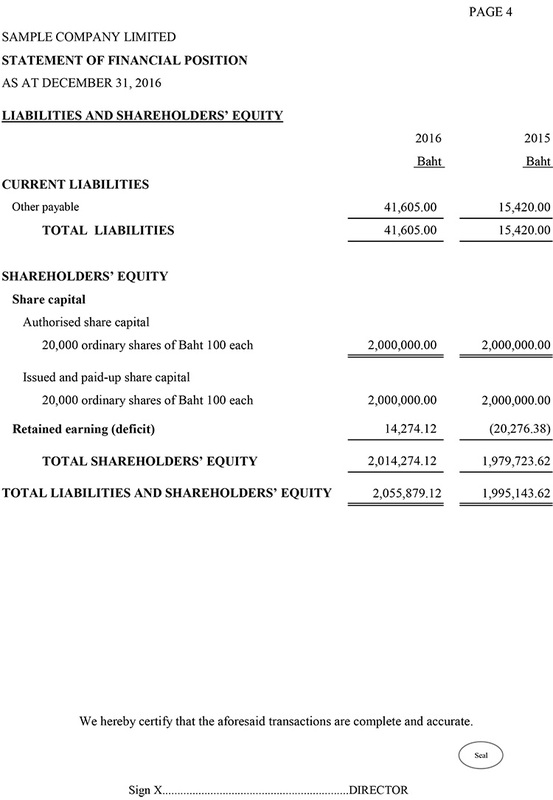 2) Alien hold the share lower than 40% and be the director. Q3: Is there any restriction or delay about starting business activities from the moment of the Dormant Company creation date? Panwa: No restriction for delay of activity from the registration date of dormant company. Anyway case of registration VAT, Revenue Dept will delete out form their data if no business activity within 1 year that mean you can re-apply again when start business. So I recommend when setting up company no need to apply VAT. Q4: What would be your fees for whole year support of dormant company? Whole year services, covering accounting and auditing financial statement, yearly Corporate Income Tax (CIT), Half-year CIT, Monthly withholding tax and VAT. The fee is Baht 36,000 per year. Yearly services, covering accounting and auditing financial statement and Yearly CIT ( not any tax during the period). Q5: Can the company stay in dormant status, until we are ready to start our business? Panwa: Yes, the company can be held status of dormant as long as you want. Q6: Are the foreign shareholders eligible for a Non-Immigrant B visa while the company is still in dormant status? Panwa: No, it's not allow for dormant to apply NON B.
Q7: Can we open a bank account for a dormant company? Panwa: Yes, the dormant company can open company bank account but the foreign director must having work permit, anyway case of without work permit Panwa can can recommend you to open with a local bank (without require work permit of director) by this you can get saving bank account, current bank account for Thai and Multi-Currency and also you can get TOKEN device for optiain the password for access internet banking from anywhere (outside Thailand).